Panaji: Under the shelter of Radha Krishna Temple, the samiti of Panaji organised a small program on the eve of Easwaramma day- in remembrance of the divine mother of Sri Sathya Sai. It seemed the Samiti was preparing for this day for weeks. 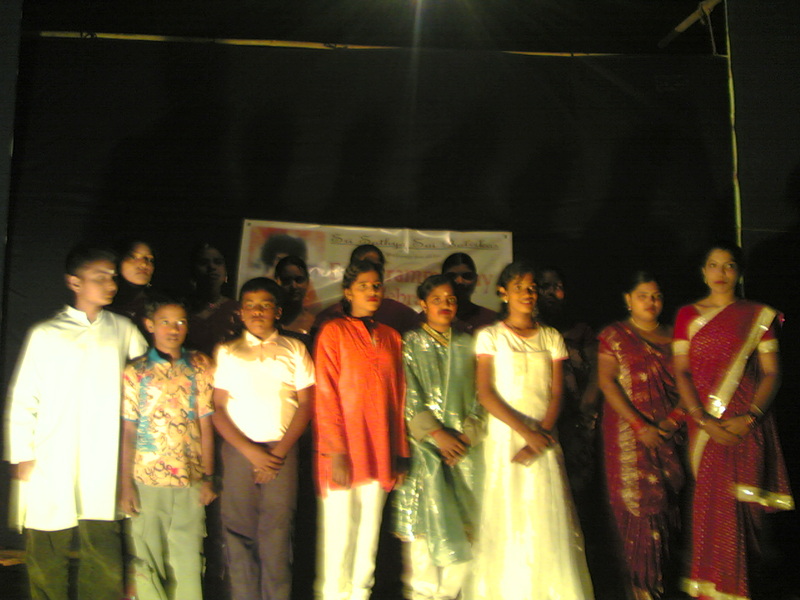 The balvikas students became a main part of the program. 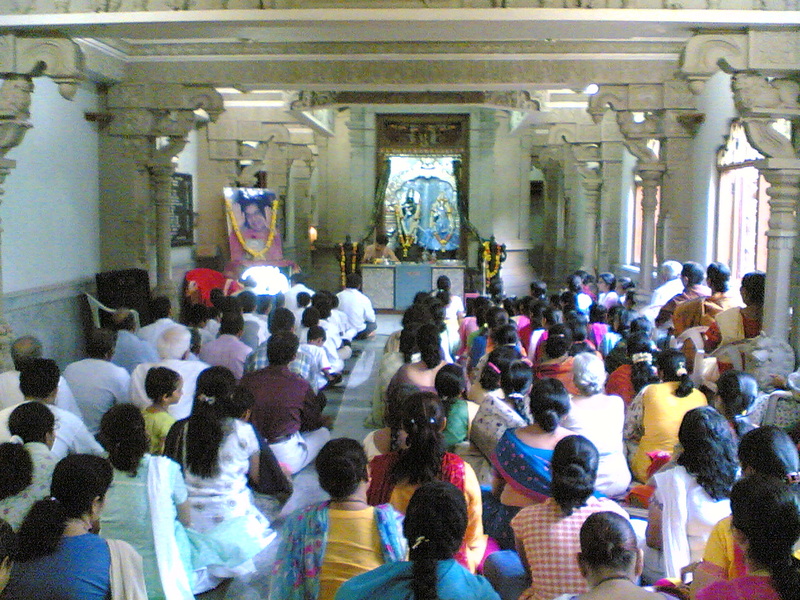 The main hall of the temple was filled with sai devotees and parents of Balvikas students, and no one could move an inch. The function commenced with ‘Omkar’ and vedic chants. Then Maya didi hosted the function. Explaining the greatness and simplicity of Easwaramma, she further introduced the unique presentation that would be performed by the balvikas students. The students had been divided into groups. Each group had to give a presentation on ‘Saving Trees’. Much to the delight of the audience, each group performed well and in various ways. They conveyed their message by singing songs, showing flowchart, hymning their own poems and even by one-act play. The temple echoed with claps after every group ended their presentation. Ponda: Sai samiti of Ponda celebrated the day among the lonely aged people of Sneha Mandir. 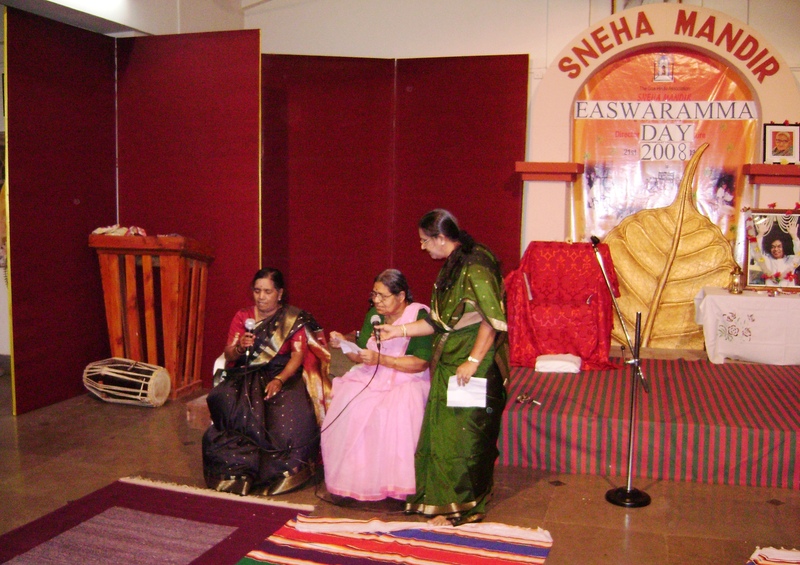 Sneha Mandir is a Old-age house meant for senior citizens who have no one to take care of them. Members of Sai samiti performed a small program for them. The function began with sweet omkar. this was followed by sacred veda intonations. Soon after this, there was a lamp lighting ceremony. 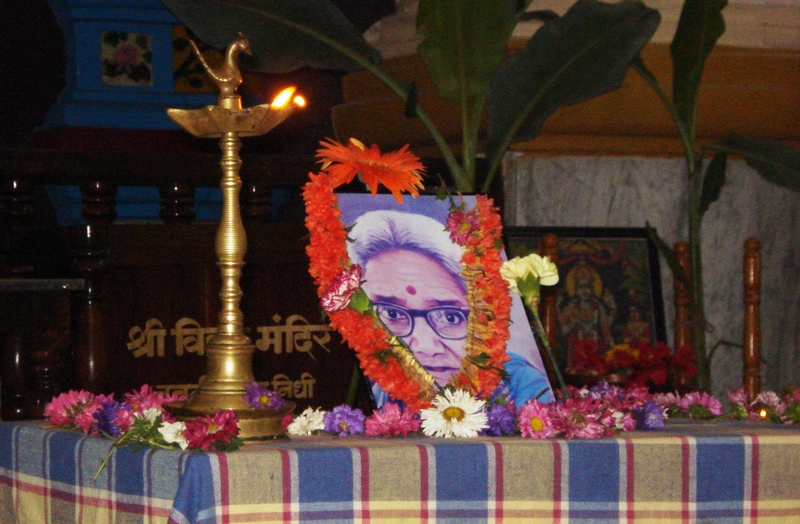 Dharwadkar aunty began the program with a short speech on the infinite Love of Sai Mother. She explained how Sai Maa helps us knowingly and unknowing and in various forms. After this, the old personalities were seen in full vigor. The came up to the stage and displayed their talents in various ways. Many sang and read out self -written poems, while others sang a song. One even walked out with her own costume made out of plastic bags. The function as if had brought them back to their childhood. It was indeed a lovely moment to see these old children hopping up and down the stage like young cubs of tigers. The program ended with bhajans and devotional songs. Margao: Sai youths of Margao engaged themselves in a number of activities on this sacred day. In the Afternoon, they carried out Narayan Seva in a Old-age home in Margao. Soon after that they headed to their usual street Narayana seva and served food to around 200 poor and needy people, and also helped them with immediate first aid. In the evening they had a small program which compromised of devotinal songs and a discourse from a spiritual personality. The program ended with Aarti and prasadam. Mapusa (10th May, Camurlim): Preparation for the Easwaramma Day began in early afternoon. Sai devotees and local villagers were busy erecting the stage for the evening function, and inside the lord vithal temple Balvikas students were busy rehearsing their actions and dialogues while some were getting a make-up done on them for the genuine feeling. As the sun set in the background, lights of the stage switched on. The function commenced at about 7 pm with chanting of ‘Omkar’ along with liting up of the lamp. Soon the drama began. The first drama was of a king who did not believe in God. He questioned his courtiers the about the existence of the supreme force, many were unable to answer. But one of them makes the king realise the god by giving various examples. One dialogue begins thus, ‘You cannot see the butter in milk, but butter exist in every molecule of it. So is God present in every atom of creation, but cannot be seen through ordinary eyes’. A musical dance performed by the balvikas students followed. After the dance there were three other dramas. First was based on omnipresence of God. It showcased a an old woman who was very sick and had no one to take care of. God assumed the form of his late son and called upon a doctor to diagnose her. The second skit was based on ‘Sharing’. It picturised the implementation of moral values like sharing and love for mankind. In the drama a small boy is told to bring a dozen banana to home. On the way, he finds some beggars who had not eaten anything for days. With out a second thought he gives them away to the beggars. While entering the home he fears that he might be scolded by his father for doing so, but his father gently caresses him and encourages him. This drama provides a lesson to all parents who teach their children all moral values, but do not implement it in their own lives. Last but not the least was yet another drama that sparked the light of transformation in every hearts. The drama performed by the balvikas students was based on modern day people’s selfish prayers to God. Firstly, a devotee weeps before the Lord Vithala as to why is there so much suffering in the world. The lord consoles him and tells him to wait and watch. Soon a series of people gather in the temple asking for the fulfillment of their desires. One asks for rain as her husband is a farmer, while a potter asks for a dry day. One doctor prays for people to get sick, whereas a coffin makers asks for people to die at faster rate. The devotees realises how greedy the world is and requests everyone to stop yearning for money. He says greed has no end, instead one should contemplate on god and ask for only one wish, ‘Let the world be in peace’. The splendid function concluded with ‘Loka Samastha Sukhino Bhavantu’.